Overall the Nikon D7200 is an impressive enthusiast DSLR. We didn't anticipate finding it that much better than the D7100, but with notable improvements to image quality, burst mode capacity, movie capability and autofocus, it's every bit the Canon 70D competitor. Except, that is, for its lack of a vari-angle screen. As the camera market continues to evolve, the Nikon D7200 wedges itself firmly in the traditional DSLR camp. It's shunned featuring a vari-angle screen like its Canon competitors, such as the 70D or 760D, but does include Wi-Fi and NFC for sharing pictures via a smart device. But the biggest thing to take away from the D7200 is something that can't be seen on the surface: its brand new sensor, paired with the latest Expeed 4 processing engine. It's for this reason that we've been sat on the D7200 review for a number of weeks, waiting for Adobe Camera Raw compatibility to catch up; its D7100 predecessor suffered banding issues in low-light, which isn't an issue for the D7200's new sensor. With this improvement and the second-generation Multi-CAM 3500 51-point autofocus system on board, does the D7200 have all the features to make it the enthusiast DSLR to buy? Or does its lack of vari-angle screen and broader feature set put it a step behind the competition in this ever-shifting market? 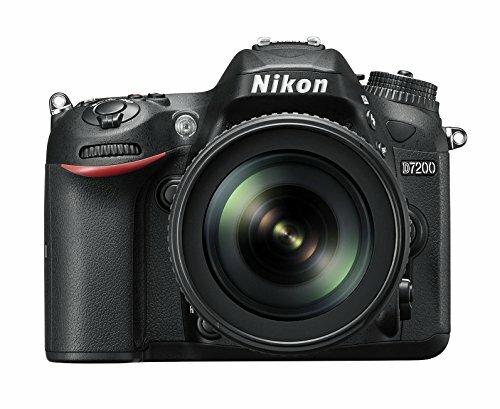 To look at the D7200 doesn't appear to be anything new: the chassis is the very same as the D7100. But that's not to be sniffed at, with weather-sealing ensuring its position as an enthusiast camera, and, in part, explaining that near-£1,000 body-only price tag. The conventional design feels absolutely right in the hand, just as a DSLR should. It's well balanced, with the buttons positioned correctly. However, whether it's a DSLR that you want is an increasingly common question: with compact system cameras also available in the market, you'll only really want to work with the D7200 if viewfinder use is up your street. Because, with the absence of a vari-angle LCD screen, the D7200 feels like an increasing minority at this level. Of course it's still possible to shoot using a live preview to show an image on the rear 3.2-inch screen, but it's tricky to handle viewing it at waist level or overhead. Having used the Panasonic Lumix GH4 for the last few months as our go-to camera, this lack of a vari-angle screen feels amiss, particularly as Canon's equivalent DSLR cameras offer such a feature. But if you don't pine for such a screen then no problems. The 100 per cent field-of-view optical viewfinder sits pride of place to the centre of the camera's rear, feels comfortable against the eye and presents a large preview image with the relevant quick-glance settings too. No qualms here. At this level digging through menus to make settings changes can be a pain in the behind, but the D7200's layout avoids that being a common occurrence. A lockable mode dial sits on top of the camera with a secondary (also lockable) dial to its base to control the drive mode (for burst mode, timer and so forth). Although pressing to release either lock button can be fiddly - particularly with glove-laden hands - it does ensure the selected mode doesn't slip into a different one by accident. The arrangement of other buttons are equally positive: to the front left-hand side there's an AF switch which can be toggled between auto and manual focus, while a button encased by this same switch can be held and used in conjunction with the camera's rear thumbwheel to adjust focus type (from single (AF-S), to continuous (AF-C)). Despite a familiar design and layout, it's the small tweaks under the hood of the D7200 that make it feel like a genuine improvement over the earlier D7100. If you're a user of that older camera, then you'll already know how well the Multi-CAM 3500 autofocus system performs (we reported only the occasional slip-up). In its second-generation format on the D7200, this 51-point setup is improved for low-light conditions (to -3EV, a full stop better than the -2EV of the original system). We've already seen this autofocus system in the Nikon D810 and thought it was probably the best autofocus system that we'd ever used. The same applies here. Using the D7200 and we've been snapping dials in ultra-low-light at ISO 12,800 no problems, the focus remaining on point and rarely faltering. Those focus points are somewhat centralised in their arrangement, although the left-right (up-down in portrait orientation) coverage is ample for the majority of shoots, whichever mode you choose: dynamic 5-, 9-, 21- and 51-point options are available and all are super-fast. Even in the continuous autofocus (AF-C) mode the 3D tracking option works well: shooting birds in the park we found focus followed the subject well, although the 18-105mm f/3.5-5.6 lens wasn't the greatest optic to test this with. Burst mode has added pep too. The six frames per second (6fps) maximum hasn't been upped compared to the D7100, but the D7200's buffer capacity certainly has been: in like-for-like SD card tests, the D7200 was able to capture 10 JPEG Fine and raw shots, double that of the five frames snapped by the D7100. Switch over to JPEG only and, assuming the right SD card is in the camera, you'll be able to snap over 100 consecutive shots (with a UHS-1 Class 10 card, we managed 55 before slowdown). One other feature we're particularly keen on is the 1.3x crop mode. This not only trims the 24-megapixel image frame down to a 15.4-megapixel crop but also condenses the autofocus area to cover the majority of the frame. Unlike other competitors that offer in-camera crop modes, the D7200's 1.3x crop can also be used to capture raw files and it even opens up the burst mode to be a frame quicker - increased from six frames per second (6fps) maximum up to seven frames per second (7fps). Then, of course, there's the addition of Wi-Fi and NFC. For us this isn't a huge deal-breaker feature though. Sure, it's a nice-to-have, but camera companies have been slow at implementing such technologies and, even once they have, they tend to be a little more long-winded in approach than they ought to be. In Nikon's case the Wireless Mobile Utility (WMU) app pairs from smart device to the camera via Wi-Fi direct. But as you're usually already on a home Wi-Fi network on, say, your smartphone or tablet, switching between them is a faff and adds to the overall time. Time-out is also common once a connection is made too, which means connecting all over again. Once pairing is achieved, the Nikon WMU application offers an easy way to view images on camera, download them to device and, from there, share to other sources. Or, if you want, you can use smart device as a remote trigger for the camera itself, which is a nice touch that can be thought of like a wireless cable release. Wi-Fi is also one of the evils when it comes to battery life, as it'll zap through juice. Fortunately the D7200 has exceptional longevity per charge, particularly if you go light on connectivity. The inclusion of the Expeed 4 processing engine makes a slight improvement compared to the D7100, but not one that we really noticed. Still, the five-bar battery life - shame it's not a percentage display for heightened accuracy - only lost two of those bars after a couple of days casually shooting. All in, around 1200 shots per charge is within easy reach. The biggest take-away from the D7200 is its image quality, offering comparable quality to the Canon EOS 70D throughout its sensitivity range. We've had the D7200 for many weeks, awaiting the relevant Adobe Camera Raw update, and the first thing that we had to check was whether the new sensor eradicates the banding issues experienced by the D7100. Fortunately it does, which is a big step forward for low-light photographers, or those who make adjustments in raw. By boosting exposure and shadow detail there's no longer an issue with horizontal "lines" - that look like a printer when it starts to run out of ink - cutting through the shadow areas of an image. Although DSLR image quality tends to be fixed at a given level these days, with marginal improvements in sensor advancements, we find the D7200's images to be that much cleaner than its predecessor's. The absence of a low-pass filter in the camera means everything is sharp - likely enhanced all the more by better lenses, not the 18-105mm kit lens we've been using - while a sensitivity boost of two stops (ISO 25,600 can be pushed to ISO 104,600) shows a slight detail improvement thanks to the latest Expeed 4 processor. Colour and exposure from the 2,016-pixel RGB metering sensor is typical of Nikon stock and we've not experienced issues with moire that can result from a low-pass filter-free setup. Contrast can benefit from a boost in post production in some situations, but we've been happy with the level of quality overall. The general absence of image noise in shots is one of the most impressive features, with shots from ISO 100 to ISO 800 presenting a clean and clear frame. Even by ISO 6400 there's little disruptive image noise, colour noise is next to non-existent and colour avoids descending into too drab a colour palette. However, image processing does opt for a little softness at the expense of image noise, with JPEG shots upwards of ISO 1600 lacking the bite of sharpness and colour that their raw counterparts exhibit. Of course that's the playoff between more pronounced grain in raw - but the choice is yours. In addition the movie mode also sees a boost: now capable of capture Full HD (1920 x 1080) capture at 60fps, doubling the frame rate of the D7100 predecessor. There's also a reworked movie menu with more options, including zebra stripe focus pattering, among other controls - ranging from sound level sensitivity to crop factor (full sensor or 1.3x crop for magnification benefit). The Nikon D7200 really pulls it out of the bag where it matters. From enhanced image quality to improved autofocus performance, it's a solid enthusiast DSLR that rights many of the wrongs of its predecessor. In particular there's no longer prevalent banding when making raw file adjustments, which is the biggest issue of the earlier D7100. For all its good, however, there's one key downside: the lack of a vari-angle LCD feels amiss, particularly considering the competition and movie mode improvements. And with Nikon putting such screens even in its full-frame range (see the Nikon D750), it makes the absence here unusual. The inclusion of Wi-Fi and NFC hardly counteract that. Another pointer is whether a DSLR is what you actually want to buy. The viewfinder-focused method of control is a must for the D7200, whereas compact system cameras - while not offering continuous autofocus in the same league - deliver a more screen-centric solution. Not a direct D7200 criticism, just a reality of the current camera market.